Religious practices were often outright banned as well. For example, the British eventually banned the Sikh custom of carrying swords to prevent rebellion and anti-colonial sentiments. Though the British made some beneficial reforms regarding backward practices like sati (in which widowed women were burned), it is difficult to speculate whether or not this would have happened without the British regime. In any case, even if some, such as women, were benefited by cultural reforms, they were still heavily oppressed but now for their skin color and race. Many may argue that the oppression of Indians even slowed down social progress for women, despite the British outlawing certain oppressive practices. Many scholars argue that the British regime actually maintained its power by pitting Hindus against Muslims in a policy known as "divide and rule". This policy inflamed tensions between the different religious factions in India and contributed to decades of conflict, communal strife, deaths, and the eventual partition of Bengal and the Indian subcontinent into India and Pakistan. The political cartoon below depicts British men cutting an Indian woman in half (as though it is a magic show) with a man crying, "I only hope nothing goes wrong Madam". The woman represents the Indian subcontinent, whereas the British Men represent the British Raj. The urgency which can be seen in the two men sawing the woman, as long as the almost comedic worry and uncertainty of the man in the upper right corner, reflects astutely the situation the Raj and India were in at the time. Cyril Radcliffe was actually tasked with drawing the borders between India and the soon-to-be-created Pakistan over the time frame of a single lunch. 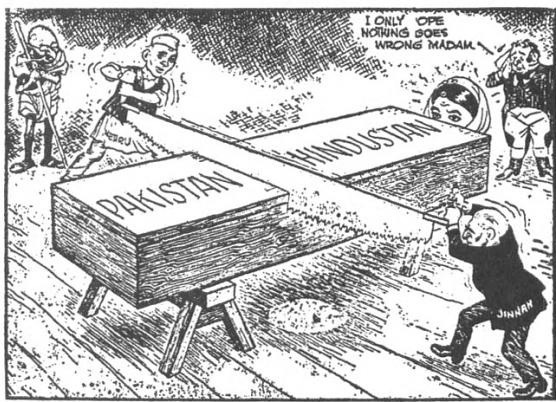 Truly, this comic captures the frivolousness and frenzy of the Indian partition in the hands of the British. The final borders did not make ethnic or geographical sense (as was all too true for the African borders created by European imperialists as well). 30 million people tried to desperate escape one country or the other, and it spiraled into horrific violence between Hindus, Sikhs, and Muslims. This violence and lasting cultural displacement could have been avoided had the partition been thought of more carefully. In 1948, Mahatma Gandhi was shot by Nathuram Godse, a Hindu extremist who believed he had not done enough to prevent partition.